I apologise for my lack of blog posts ,life has been a bit of a rather lovely whirlwind of late,but here we are….July already! how did that happen? So what have I been up to? 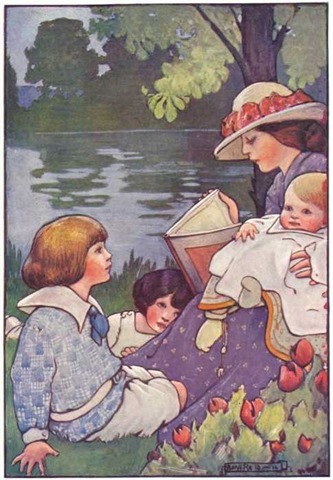 well I would love to tell you I have been having the time of my life picnicking on the river banks,adorned with cherubic infants like the lady in the image,Alas! my cherubs are grown up now and I am more likely to be found wandering around Topshop with them,as life slowly drains from me and my purse becomes lighter! but then these are happy days with my little women,memories in the making. However! for the first time in a very long while,I am feeling quite balanced , I use the word cautiously,for I fear it may all come tumbling down around me at any moment,but for now,no major drama,everyone is well,my garden is blooming and God in his heaven sings.So here very briefly are at least some of the little changes that have helped me to sleep at night once again. 1)I am wearing sparkly flip flops,going to the beach,singing in the car to Lana del Ray,painting my nails orange. 2)I am eating healthy foods,mainly fresh fruit and vegetables,raw wherever possible.I am loving my body.Finally. 3)I am meditating daily.Thanks to finally finding a wonderful teacher,albeit briefly,he has changed my life. 4)I am decluttering my life.One day at a time. 6) I am spending time with the loveliest of friends.Drinking tea,laughing….feeling blessed. 8)I am literally taking the time to stop and smell the roses! Summer is likely to be fairly fleeting here in the bleak north! so I am out in the garden every day. 9)As always I am reading…and reading…and reading.Bliss. 10)I am dreaming……and wishing on stars…..and moving forwards…..one sparkly flip flop step at a time. Next Article on Magnificent obsessions…..